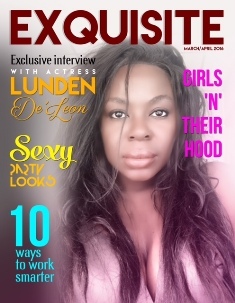 Los Angeles, CA - Actress Lunden De'Leon has been tapped as the cover girl for Exquisite Magazine's February/March 2016 issue. Inside, the "We're the Millers" actress talks about her role as "Mutoni" on the new scripted Bravo Television series "True Fiction" as well as her starring role in the coming of age film "Turnt". Best known for her role as Joanne Mbutu on the hit television series "Vital Signs", De'Leon has starred in over 50 television shows and films including the 20th Century Fox movie "The Ladies Room", the HBO film "Kickin Chicken", "Cryptz", "Faux Pas," The Lake House and the action thriller "Fury". De'Leon co-starred in the blockbuster comedy "We're the Millers" alongside Jennifer Aniston (Friends), Jason Sudeikis (Horrible Bosses) and Ed Helms (The Hangover). The actress soon received rave reviews for her performance in the television drama "Somebody's Child" alongside Emmy Award nominee Lynn Whitfield (Josephine Baker Story) and Michael Jai White (Batman Returns). The former model also starred in the television movie "12 Dog Days of Christmas" portraying the wife of Reginald VelJohnson (Family Matters, Die Hard, Real Husbands of Hollywood). Exquisite Magazine will hit newsstands February 2, 2016.